From the top menu, select Insert > Effects > effect. 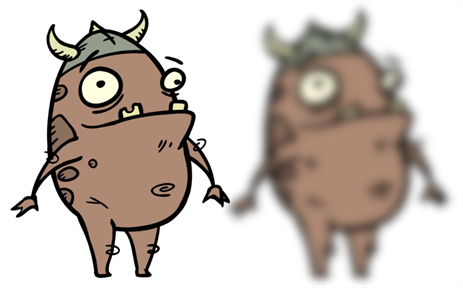 In the Layers toolbar, click the Add Layers button and select Effects > effect. From the Timeline menu, select Insert > Effects > effect. The effect appears in the Timeline view. In the Camera view, click the Render View button to see the scene's rendered current frame and effect. Note that most effects cannot be played back in real time. You need to use the Render and Play option in the Playback toolbar. NOTE: By default, your background will appear pitch black. To remedy this, you can add a Colour Card layer at the bottom of your layers list, and tweak its colour in the Layer Properties view. In the Timeline view, double-click on the effect layer to open the Layer Properties window. You can also select the effect layer and see its properties in the Layer Properties view. 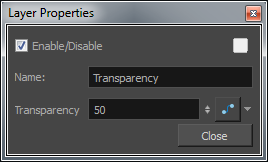 The Layer Properties view opens, displaying the parameters available for the selected effect. In the Layer Properties view, adjust the effect’s parameters as needed. Each time you make a change, the Camera view will need to refresh the render, which may cause a little delay before you can observe its effect—see Filter Nodes. To play back your scene with the final effects, in the Playback toolbar, click the Render and Play button. NOTE: Once you have set the parameters for the effect, you can store it in the Library view as a template, so you can quickly reuse it without resetting the parameters again—see About Templates.